And found no match. This image kinda shows the black "collar" and the orange tissue on either side of it. Nine years! I love it! Thank you! Good bug! would be something near Panthea. Do you have any of those down there? Panthea isn't very common here and in any case, there doesn't seem to be much information. 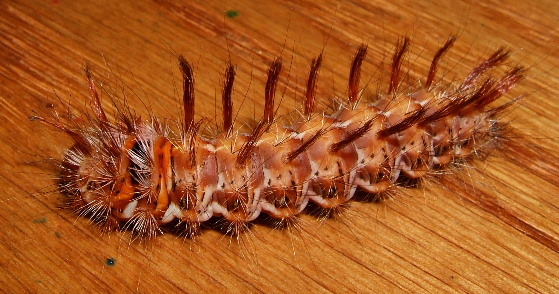 P. gigantea is most widespread but I could find no larva images. P. apanthea has a record in northern Arizona but seems to be very rare. P. judyae and P. greyi seem to occur in SE Arizona. We'll try to imagine what it might look like all fluffed out and see if we can come up with something. Those were the days! I guess its time to look around some more. Thanks for the lead.